Location: Both sides of bridge under Blackwood Hall Lane (extension of Old Station Road). The station building and goods yard were north-west of the bridge on the down (Leeds-bound) side of the railway. Luddenden Foot (two words always appear to have been used on Ordnance Survey maps) is a large village in the former West Riding of Yorkshire, built along the A646 Burnley to Halifax road which follows the floor of the River Calder valley. Historically it is an addition to the village of Luddenden, a hillside community first recorded in 1284. In that year the name was given as ‘Luddingdene’, thought to mean ‘valley of the stream called the loud one’; the stream is now known as Luddenden Brook. Luddenden Foot developed where the stream reaches the River Calder. Whereas the main routes in the locality, including road and rail between Burnley and Halifax follow the main valley floor, until the eighteenth century they clung to the moorland as the Calder valley bottom was damp and (as it still is) prone to flooding. The cobbled packhorse trail which runs through Luddenden was once the equivalent of the M62, providing a major goods route through the Pennines when the main mode of transport was packhorses, and Halifax was the principal market for wool. Luddenden was typical of moorland-edge villages in the central Pennines in which families pursued a dual economy of farming (including sheep) and weaving of cloth. From about the mid eighteenth century textile mills using water power gradually replaced domestic weaving. In the Luddenden valley the mill owners formed the Cold Edge Dam Company early in the nineteenth century, and by the 1830s this company maintained three reservoirs on the moors above, allowing no fewer than nine water-powered mills to be supplied in the valley. 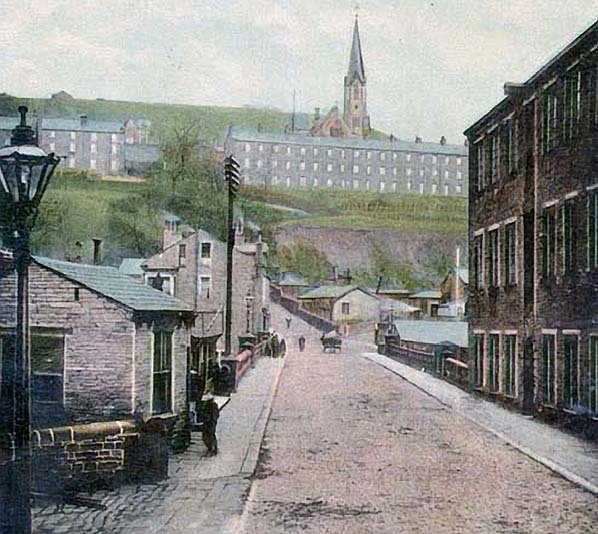 By the 1850s, in order down the valley these were: Spring Mill (worsted); Hole Bottom Mill (worsted); Lumb Mill (worsted); Wainstall Mills (wool); Holme House Mill (cotton); Dean Mill (paper); Peel House Mill (worsted); Luddenden Mills (corn); and Luddenden Foot Mill (wool and corn). The OS 1: 2,500 map of 1892 adds Longbottom, Cooper House, Boy and Delph mills in Luddenden Foot, all manufacturing woollen cloth, and there are tenter fields (where cloth was stretched out to dry) shown at the north-west and south-eastern ends of the growing village; the latter has given its name to the modern Tenterfields Business Park. The ward of Luddenden Foot has a population of 10,653 (2011), but no longer has a railway station on the Manchester/Burnley – Halifax/Mirfield route. There is inconsistency in the rendering of the place name. Robinson’s Railway Guide of 1841 is possibly alone in referring to the station as Luddenden. Ordnance Survey maps seem always to have used the two-word form, Luddenden Foot, and Bradshaw used two words until 1865/66 when the single word was adopted. From 1890 the Railway Clearing House consistently used the single word and the Lancashire & Yorkshire Railway, London Midland & Scottish Railway and British Railways stuck to this form. The OS 1964 1: 2,500 map obstinately names ‘Luddenden Foot Station’ making no concession to railway practice. The name might be thought somewhat cumbersome and the local people have their abbreviated version of it. In Hebden Bridge (pub: Frances Lincoln Ltd, 2012) Paul Barker notes that Todmorden is Tod’, Hebden Bridge is t’Brig, Mytholmroyd is t’Royd and Luddenden Foot is t’Foot. Platform staff meeting trains at Luddendenfoot station would call out “t’Foot!” probably confusing (or amusing) passengers on board. A railway between Manchester and Leeds was first mooted, unsuccessfully, in 1825, and a further proposal in 1830 also foundered, partly owing to opposition by canal interests – specifically the Rochdale Canal Co, the Aire & Calder Navigation and the Calder & Hebble Co. The Manchester & Leeds Railway in its 1831 Prospectus was, in turn, very dismissive of canals as a speedy means of transport. Finally, in 1836 a prospectus was issued for the M&L ‘to form a central portion of a great main line running east and west between Liverpool and Hull’, to be surveyed by George Stephenson and Thomas L Gooch. Despite continued opposition from the canal companies, landowners whose property would be violated and some Leeds merchants, the project received the Royal Assent on 5 May 1837, albeit with minor variations to the proposed route. The railway, which stretched from Manchester to Normanton and onward to Leeds via North Midland metals, was dubbed the ‘Eleven Towns Railway’. The line passed through the Pennines and required numerous viaducts and tunnels. The watershed was crossed by means of the Summit Tunnel (1 mile 1,125yd) between Littleborough and Todmorden, enabling the line to rise no higher than 537ft – much lower than the altitudes reached by the neighbouring Copy Pit and Rochdale-Bacup routes. Construction of this substantial tunnel delayed the opening of the line, but there were also problems encountered between Todmorden and Sowerby Bridge. One was the greed of landowners - Samuel Turner at Sowerby Bridge, and Thomas Fielden of Todmorden, a textile manufacturer and, ironically, a director of the Manchester & Leeds Railway; another was the 250yd Charlestown Tunnel (between Todmorden and Hebden Bridge) where the geology proved obstinate and the tunnel was abandoned in favour of a diversion via a 30 chain-radius curve (resulting in a speed restriction on the line). The section from Manchester (Oldham Road) to Littleborough opened to the public on 4 July 1839, followed by Hebden Bridge to Normanton on 5 October 1840. From Hebden Bridge the line was opened to the north end of Summit Tunnel on 1 January 1841, and it opened throughout on 1 March 1841. Initially trains terminated in Manchester at Oldham Road station, but from 1 January 1844 Manchester Victoria was brought into use. In July 1847 the Manchester & Leeds Railway amalgamated with some smaller companies to form the Lancashire & Yorkshire Railway (LYR). The LYR grew until it owned 601 route miles in the two counties, with the former M&L through the Calder Valley being the thread that connected the intricate networks to the east and west. 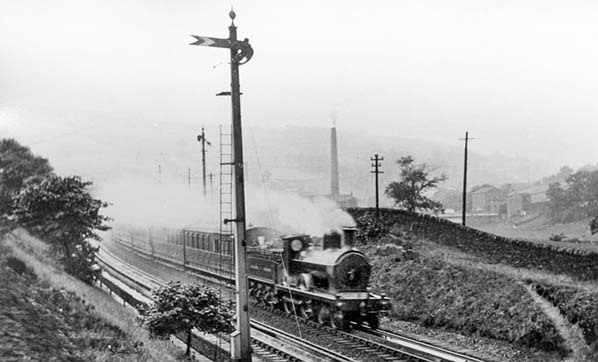 Increasing traffic placed strains on the Calder Valley line, and the LYR’s vision was to widen the entire route between Manchester and Normanton to four tracks: an ambitious intention given the difficult terrain and urban and industrial congestion of the valley floors. In 1897 an Act of Parliament authorised the quadrupling between Todmorden and Brighouse, through Luddendenfoot, and further Acts at earlier and later dates covered other sections of the route. In 1906 an Act amending that of 1897 regarding work at Luddendenfoot was passed. The quadrupling between Hebden Bridge and Luddendenfoot was contracted to Holme & King for £31,190 on 24 September 1903 and the completed work was approved by the Board of Trade on 9 January 1906. The rest of the route between Todmorden and Sowerby Bridge was to remain double track because of the sheer physical difficulty and expense of widening it. In August 1840 Branwell Brontë was appointed assistant clerk in charge of Sowerby Bridge station on the newly opened Manchester & Leeds Railway, at a salary of £75 a year, but he was swiftly promoted on 1 April 1841 to the £130 post of booking clerk at Luddendenfoot station. Unfortunately, according to his friend Francis Grundy, a young railway engineer, Brontë ‘spent his time in Calder valley pubs [including the ‘Lord Nelson’ in Luddenden], neglected his job, doodled in the margins of the company’s legers and … went thoroughly to the bad’. In March 1842 an audit of the Manchester & Leeds legers revealed a discrepancy of £11 1s 7d. The money had probably been stolen by Watson, the porter, who was left in charge when Brontë went drinking. The shortfall was attributed to constant and culpable carelessness, rather than theft. The missing sum was deducted from Brontë’s salary and he was dismissed on 4 March 1842. Like his illustrious sisters, Branwell Brontë’s life was to be short. Having declined into ‘chronic alcoholism, opiates and debt’, he died at the family’s home, Haworth Parsonage, at the age of 31. He was buried in the family vault in St Michael and All Angels church, close to the Parsonage. The rough terrain which imposed tunnels and viaducts on the central part of the Manchester & Leeds Railway route also threw up challenges in placing and designing the stations. Biddle in Victorian Stations (1973) makes special mention of the series of fascinating stations which had to be accommodated on awkward sites; Luddendenfoot was no exception. Luddendenfoot station was built at the point where Blackwood Hall Lane crosses over the railway on a steeply sloping bridge. A description of the station in the 1840s by Francis Grundy (see above) referred to it as ‘a small roadside place … a rude wooden hut and there was no village to hand’. The site was constricted by a deep cutting south-east of Blackwood Hall Lane whilst on the opposite side of the bridge there was a steep slope immediately south-west of the line and the extensive goods facilities occupied flatter land north-east of the line. The platforms extended on both sides of the road bridge, but the down (Normanton/Leeds-bound) platform ended immediately north-west of the bridge, some yards short of its neighbour, thus enabling a goods loop to meet the down line. In compensation the down platform extended further south-east than the up platform. The station building containing the offices was set at right angles to the platform along the approach road. Behind the building, which was at platform level, Blackwood Hall Lane rose steeply to cross over the railway and the platforms. The somewhat austere station building was single storey, constructed of coursed sandstone with rectangular openings under a hipped roof. It adjoined the northern end of the down platform and a footbridge enabled passengers to reach the up (Manchester-bound) platform. A further single-storey building with a pitched roof stood immediately east of the station offices on the approach road; this is thought to have been the goods office. The OS 1:2,500 map of 1894 indicates that there were waiting shelters on both platforms south-east of the road bridge, but by 1907 the OS map shows that the up platform shelter has been removed whilst that on the down platform has been lengthened. On the up platform, north-west of the road bridge, there was sufficient space for the Lancashire & Yorkshire Railway to construct a range of modest but attractive timber buildings and an awning of generous proportions. The awning was supported by brackets incorporating a geometric pattern resembling a wheel, and provided with saw-tooth valances which extended along the sides of the building. However the down platform was cramped and shelter was supplied (on the opposite side of the road bridge) by a steeply sloping awning supported by narrow timber screens jammed against the stone retaining wall of the cutting; surprisingly the awning was given attractive scalloped valances. 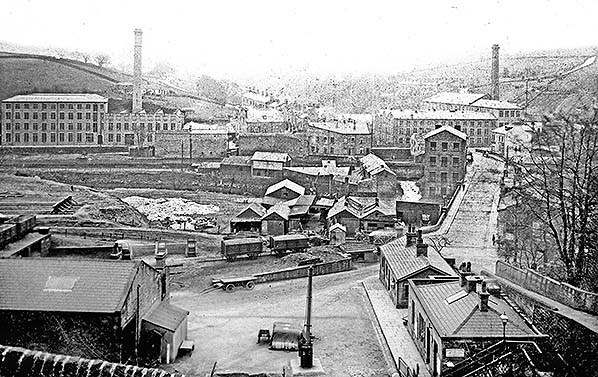 The station’s goods facilities were remarkably extensive given the limited amount of flat land on the floor of the Calder Valley. The goods warehouse was located on the down side of the running lines about 20yd north-west of the station building and reached by the same approach road. It was of stone construction and a single siding passed through it. Two goods loops were parallel to the running lines and about a dozen sidings splayed south-eastwards on a broad embankment extending up to the River Calder. 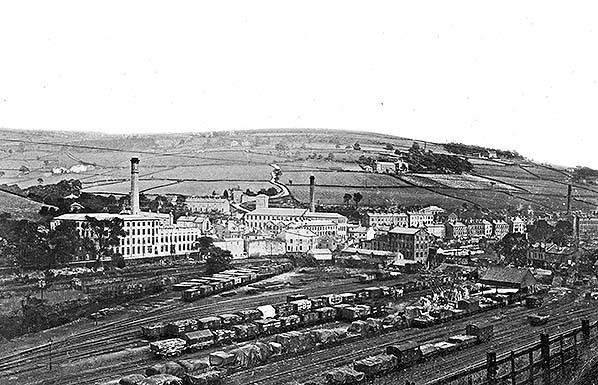 The 1907 1: 2,500 OS map indicates that there were two yard cranes, and the Railway Clearing House Handbook of 1904 records that 5 tons of crane power was installed; the same source states that Luddendenfoot handled general goods as well as livestock and horse boxes, and lists Clay’s Siding and Sowerby Bridge Gas Works (Whitworth’s) Siding under the station name. In common with most stations there was a coal depot at Luddendenfoot. South-east of Luddendenfoot station and before Sowerby Bridge Tunnel water troughs were provided to enable locomotives to take on water whilst in motion. The station and water troughs were on a relatively gentle gradient of 1 in 377. Departures from Luddenden Foot [sic] in 1841 are given below. The Manchester terminus is Oldham Road and at Leeds it is Hunslet Lane. Luddendenfoot station could have become a junction had plans of 1864-65 come to fruition. In 1864 a company was formed to build a branch about 1¾ miles in length from Luddendenfoot up the Luddenden valley to the village of Booth. Justification for this project was a statement that between 30,000 and 40,000 tons of stone passed over the road to Luddendenfoot each year. In May 1865 the Luddenden Valley Railway received Royal Assent but abandonment was subsequently authorised by the Board of Trade in September 1870. Destinations of trains are not always made clear in Bradshaw at this time. In 1901 the road tramway from Halifax reached Luddendenfoot and Mytholmroyd, extending to Hebden Bridge the following year offering a convenient alternative to the train service. As early as 1864 there were discussions within the LYR hierarchy regarding possible amalgamation with the London & North Western Railway and to this end in 1873 a Bill was deposited in Parliament. For reasons that are not entirely clear it was thrown out, and it was not until January 1922, after some years of close co-operation, that the amalgamation took place under the name of the LNWR. This was one of a number of amalgamations in the run up to the ‘Big Four’ Grouping of January1923. The following timetable is from the brief period during which Luddendenfoot was an LNWR station. Under London, Midland & Scottish Railway (LMS) management from 1923 the station was re-signed with the company’s ‘Hawkseye’ nameboards and it is likely that the LYR-era gas lamps beneath the awning were replaced during this period. Despite the growth of public transport – both trams and motor buses on the parallel Todmorden to Halifax road – a reasonably generous provision of train departures was maintained, albeit at irregular intervals as had been the case in LYR times. The trams were withdrawn in the 1930s. From January 1948 the former LMS lines in England and Wales formed the new British Railways’ London Midland (LM) Region. Luddendenfoot was within this region until 2 April 1950 when there were major boundary changes whereby much of the former LMS network within the West Riding was transferred to the North Eastern (NE) Region; this included the Calder Valley line as far west as Hebden Bridge (inclusive). LM signage was not installed at Luddendenfoot during its brief spell in this region, but neither did the NE renew the signage; it seems that the LMS nameboards were retained until the station closed, but probably repainted in NE tangerine. It is likely that LYR signs were retained for identifying rooms and giving directions. The station continued to be lit by gas. Despite the change of administrative region, train services continued to be provided by the LM, and it was not until June 1955 that Luddendenfoot appeared in the NE regional timetable. This anomalous arrangement possibly explains why the new BR(NE) network map produced from 1950, including the ex-LMS lines shown now as NE, was displayed on posters, but the reduced-scale map of the region did not appear in the timetable book until June 1955. 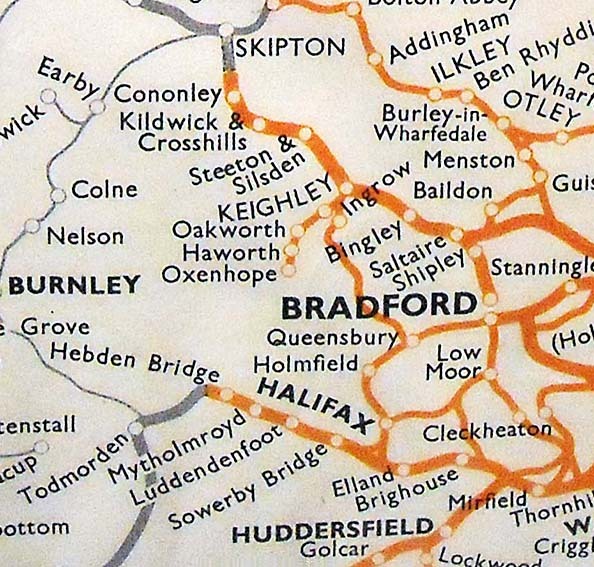 A 1951 version of the poster map is on display in a museum at Ingrow West station on the Keighley & Worth Valley Railway and the relevant section is reproduced here. The table below, from the summer 1954 BR(LM) timetable, shows a reduced frequency of train calls in comparison with the pre-war services. The slight differences in timings of individual trains on Monday-to-Friday and Saturday, notably in the up direction, give a misleading impression of a generous service. Departures on Monday-to-Friday between the morning and late afternoon peak times have been all but eliminated. By 1955 Luddendenfoot station was closed on winter Sundays (mid September to mid June) and this appears to have continued throughout the remainder of the station’s life. The greater frequency and convenience of road public transport and the increasing use of cars lured travellers from the railways, and even some substantial settlements in the Calder Valley provided insufficient railway passengers to keep their stations open. Elland, with a population of about 20,000 in 1961, together with Greetland and Luddendenfoot were closed to passengers on 18 June 1962. This was just nine months before the publication of the Reshaping of British Railways (‘Beeching Report’) that identified other West Riding towns whose railway stations were considered dispensable, such as Cleckheaton, Ilkley, Marsden and Pudsey. The final season’s train departures from Luddendenfoot are listed below. However, this station (with Elland and Greetland) appeared in error in the summer 1962 timetable which commenced on their day of closure. The ‘phantom’ summer service was similar to the winter 1961-62 timetable, but with some minor alterations to some timings. Luddendenfoot’s goods yard remained open as a ‘public delivery siding’ until 3 May 1965. The passenger station had been entirely demolished by February 1971 when John Mann’s photograph of the site was taken. Travelling by train today through the constricted site of the station it is difficult to imagine that it ever existed. A number of stations in the West Yorkshire conurbation have opened or reopened since the early 1970s, including Brighouse (on the former line from Luddendenfoot to Normanton). Low Moor, between Halifax and Bradford is expected to reopen in 2017 and the prospects look good for the reopening of Elland. However no convincing proposal seems to have been made to restore Luddendenfoot’s train service, and its residents must make do with Sowerby Bridge (2 miles away) or with Halifax or Brighouse for journeys to or from London. 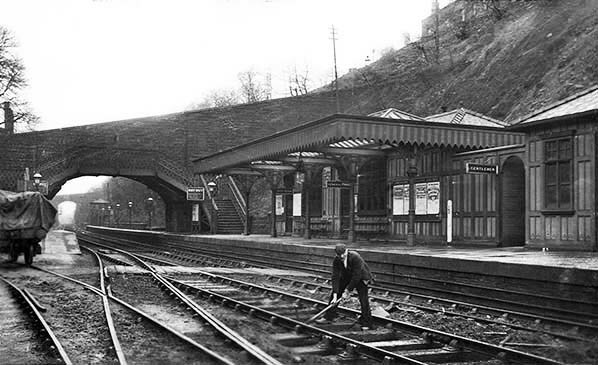 Looking south at the up (Manchester-bound) platform of Luddendenfoot station circa 1900 as a permanent way worker attends to the down track. Both platforms stretch under Blackwood Hall Lane bridge, but the down platform’s north-westerly extent is limited by the junction with the siding in the foreground. The main building containing the booking office is out of sight to the left, on the near side of the road bridge. Passengers use the footbridge adjacent to the steeply-sloping road bridge to reach the up platform. The buildings on this platform have recently been constructed by the LYR to replace a shelter beyond the road bridge; they are of timber beneath hipped roofs. One of them, in which there are waiting rooms, has a substantial hipped, glazed awning; it is supported on iron columns with wheel motifs in the spandrels and is flanked by a serrated valance which extends along the side of the building. Contrasting paint has been applied to add character to the building and awning. (see also Burnley Manchester Road 1st Site). 1933 1: 2,500 OS map, There is a much more generous provision of platform buildings at Luddendenfoot in 1933 in comparison with those shown on the map of 1894. On the down platform there is a longer shelter, whilst on the up platform the shelter south-east of the up platform has been removed and a waiting room block with an awning (shown by cross-hatching) and a further building to the north-west have been constructed. As on the 1894 map the goods warehouse has not been named. The goods facilities have expanded considerably including a dozen sidings and three cranes, and a further signal box is placed beside the down main line at the north-western extremity of the goods yard beyond the northern edge of this map extract. The goods yard is carried on an embankment to the west bank of the River Calder. Looking south-west along Station Road, Luddendenfoot c1905. The road (Blackwood Hall Lane, at this point) curves to the left and rises to cross the railway at Luddendenfoot station. The buildings on the up platform and the goods warehouse are just visible. 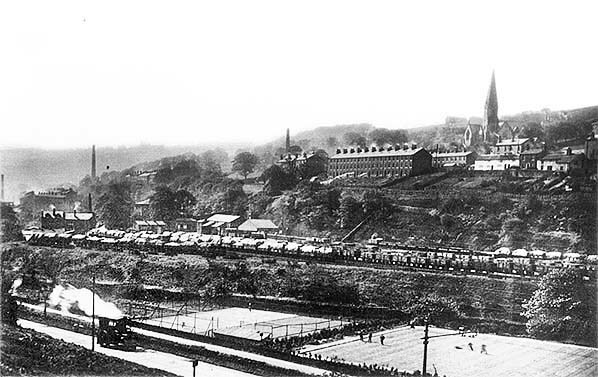 In the background Osborne Terrace and the spire of St Mary’s church are prominent. 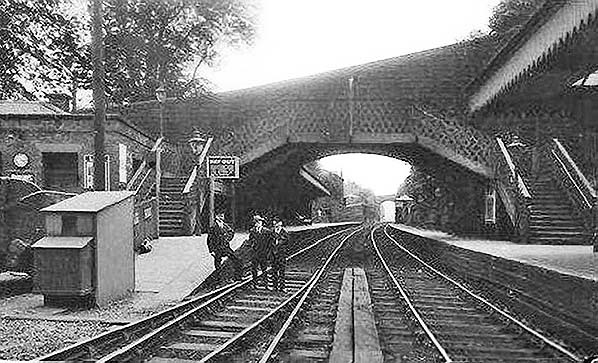 Luddendenfoot station looking south-east in 1909. The up platform is to the right with timber buildings, single-storeyed beneath hipped roofs, and the platform in front of one of them is sheltered by a hipped awning of generous proportions. The ground behind the up platform rises steeply. Blackwood Hall Lane crosses the railway midway along this platform, and the station’s signal box is visible at the far end of the platform. The footbridge, close to the road bridge, enables passengers to cross from the booking hall, at track level close to the left-side staircase, to the up platform. The extent of the down platform is constrained by the siding, far left. 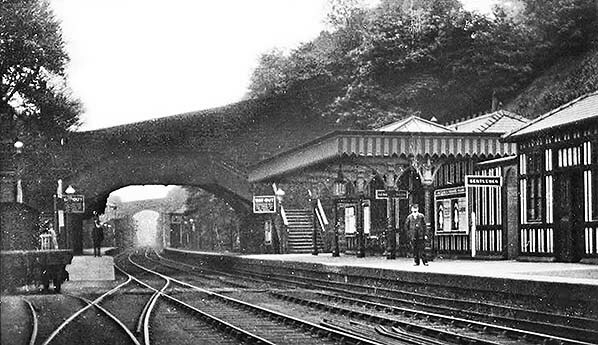 Luddendenfoot station looking south-east c1910. In the left foreground is the single-storey station building close to the ramp of the down platform. Beyond the footbridge and stone-arch bridge of Blackwood Hall Lane the down platform passenger shelter is visible. To the right is the awning of the down platform waiting-room block. 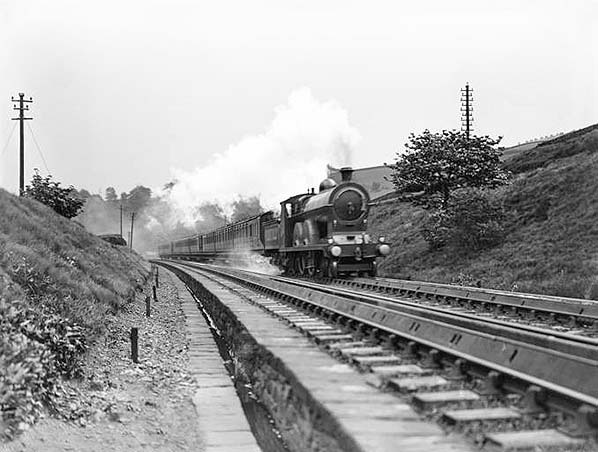 An express passenger train hauled by a L&YR Class 7 4-4-2, (this class were known as 'Highflyers' ) is seen speeding through a cutting at Luddendenfoot in May 1911. The train is using a scoop, lowered from the tender, to pick up water from troughs placed between the tracks. Troughs like these allowed locomotives to replenish their water supply without stopping. The extensive and busy goods yard at Luddendenfoot station, looking south-east - date is unknown. Click here for a larger version. Looking east from Blackwood Hall Road over Luddendenfoot station building and towards Station Road. The road from which this photo was taken curves sharply left to cross the railway and it can be seen descending steeply behind the station building; where it bends to the right it becomes Station Road. The station building contains the booking office and adjoins the north-west ramp of the down (Leeds-bound) platform. Passengers wishing to reach the up platform must use the footbridge visible at the bottom of the picture. The station building is of stone, its roof hipped and surrounded by a low parapet. What was possibly the goods office, with its pitched roof, stands beyond. In the station forecourt a crane has pride of place. To its left is the goods warehouse. The south-easternmost end of the goods sidings can be seen carried on an embankment. Clikck here for a larger version.